Sen. Rand Paul (R-KY) on Monday called for an investigation into Obama administration officials for their alleged roles in concocting and spreading the idea that the Trump campaign was colluding with Russia. Paul became the second senator, after Senate Judiciary Committee Chairman Lindsey Graham, to call for an investigation into Obama officials who were responsible for pushing the Russia narrative. While the Clinton campaign and the Democratic National Committee paid Fusion GPS to produce the dossier alleging there was collusion between the Trump campaign and Russia, numerous Obama administration officials were involved in spreading it. Fusion GPS co-founded Glenn Simpson and the author of the dossier, ex-British spy Christopher Steele, would shop the dossier to Obama officials at the State Department, the Justice Department, the FBI, and members of the media. But Obama’s CIA Director John Brennan reportedly was “so concerned” he gave an “unusual private briefing in the late summer” on the dossier to then Senate Majority Leader Harry Reid (D-NV), according to the Times. The dossier was used by FBI and DOJ officials to obtain a surveillance warrant on former Trump campaign aide Carter Page. 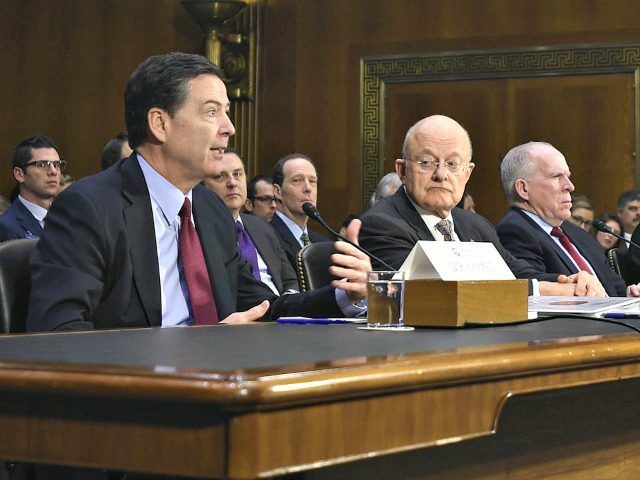 After the election, Comey briefed the dossier, which was promptly leaked to CNN, to President-elect Trump, with then-Obama Director of National Intelligence James Clapper as the prime leaker suspect. CNN reported on the briefing, prompting BuzzFeed to publish the dossier in full. However, involvement of Obama-era officials did not stop there. Anonymous former and current officials leaked to media outlets intelligence and other material to suggest a conspiracy between Trump associates and Russia. One infamous case involved the leak of highly-classified material to the Washington Post, about Trump’s incoming National Security Advisor Michael Flynn and his alleged conversations with then-Russian Ambassador Sergei Kislyak. That and numerous other leaks by former and current officials continued to spread the narrative that Trump associates colluded with Russia, with the assistance of mainstream media news outlets willing to publish them. Thanks for being one more voice against the silence of the left.